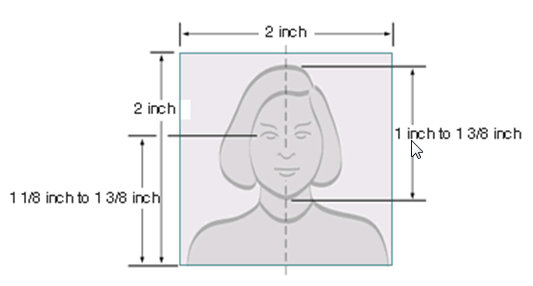 • Sized such that the head is between 1 inch and 1 3/8 inches (between 25 and 35 mm) from the bottom of the chin to the top of the head. - Uniforms should not be worn in your photo, except religious clothing that is worn daily. - Do not wear a hat or head covering that obscures the hair or hairline, unless worn daily for a religious purpose. Your full face must be visible, and the head covering must not cast any shadows on your face. - Headphones, wireless hands-free devices or similar items are not acceptable in your photo. - If you normally wear prescription glasses, a hearing device or similar articles, they may be worn for your photo. - Glare on glasses is not acceptable in your photo. Glare can be avoided with a slight downward tilt of the glasses or by removing the glasses or by turning off the camera flash. Photos copied or digitally scanned from driver’s licenses or other official documents are not acceptable. In addition, snapshots, magazine photos, low quality vending machine or mobile phone photos, and full-length photographs are not acceptable.